We are conviently located on the SWC of Golf and Roselle Road in Hoffman Estates; just a couple miles west of Woodfield Mall. Stop on by and check out our 13,612 sq ft facility. Underground Autosports offers VIP Storage packages in our indoor, heated, and secure storage facility to protect anything from your numbers matching show car, to your fully prepared racecar. Our 12' overhead drive in door provides easy access to almost all vehicles. Customers renting a car space for six months or more will receive a free spring service. Underground Autosports is proud to offer turn key track packages. These packages come from extensive testing on and off the track to provide you with a solution that will withstand the abuse taken while on course and be ready for more. Click below to find out how we can help you. 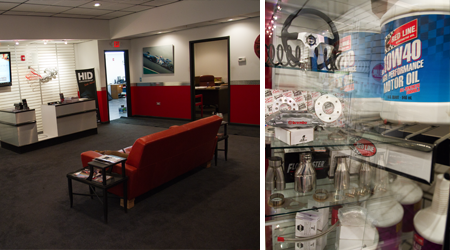 Underground Autosports strives to be Chicagoland’s premier service provider to the automotive enthusiast community. After all it takes one vehicle lover to know another one. We provide a one stop shop for best in class service for all your automotive needs whether it be maintenance or a full custom build. Put our team of highly trained engineers and technicians to work for you. HONESTY - Our business is built on a strict code of ethics and an urge to provide the best care that will keep your rides smooth and your vehicles healthy for prolonged periods. Trust is one of the cornerstones of how we do business and the services that we offer. QUALITY - We pride ourselves on providing customers with high-quality workmanship and personal service. COMPETITIVE PRICES -We are the cost-effective alternative to car dealership servicing for all scheduled maintenance on any vehicle. Read our Testimonials page and hear what our customers have to say about us. Automotive Technician (Automotive Mechanic) you will quickly and efficiently perform routine maintenance and identify the cause of breakdowns and repair them using the most optimal solutions. Install aftermarket parts upgrades.